Today we move onto Treasures By Tan, check out her Etsy shop here. I've got Carousel Pony to share today. 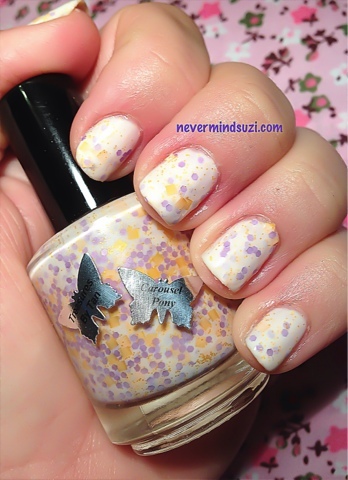 A milky polish full of yellow microglitters, lavender hexes and yellow squares. For me it took 4 thin coats to get this polish completely smooth and opaque. With this type of polish I'd have loved a wider brush to help it even out a bit more, but that's just personal preference. The finished result is pretty regardless of the brush. And I think a wee bit of thinner might just help the next time. Stayed tuned for more beauties by Tanya.